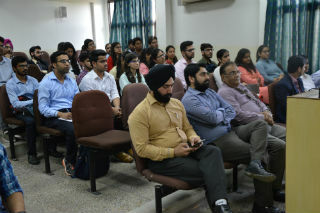 JIMS Finance Club InvestoFin organized a Session on "Financial Empowerment through Financial Education"
A special session on "Financial Empowerment through Financial Education" was organized by Investofin-Finance Club of PGDM JIMS on Thursday, 15th March, 2018. The session was conducted by Mr. Abhishek Dave, Sr. Manager, NSE and Mr. Karan Kapoor, Asst. Manager, NSE. Mr. Dave started the session with the question "What would you like to know to about financial education?" He discussed the objectives and benefits of Financial Education and the ability to make financial decisions. He gave an insight on the different regimes and reforms in Indian Stock Market. For instance, the pre 1990's scenario of stock market that was characterized by poor infrastructure and governance standards. The post 1990's scenario, where capital market got its regulator SEBI; NSE introduced online screen based trading started, short rolling settlement (T+2); dematerialization and many more reforms were introduced. Mr. Dave also elaborated on the type of markets and instruments like ETFs, Index Funds, Mutual funds etc. traded in capital market. Later, the session was taken over by Mr Karan Kapoor. 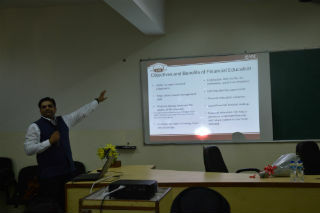 Mr. Kapoor sensitized students on NCFM modules of NSE and gave a demo on how one can get registred for the same. He handled student queries with great patience. It was great learning experience for students that would help them a long way in making a career in finance.